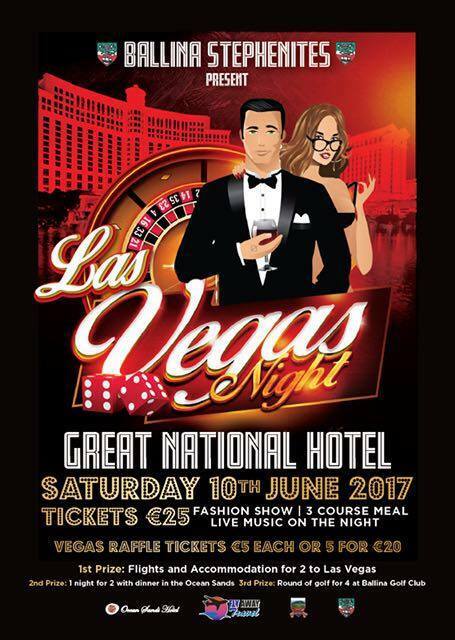 Las Vegas comes to Ballina at the Great National Hotel Ballina Saturday 10th June, as local Club Ballina Stephenites GAA Club hosts a Vegas themed night featuring a plethora black jack tables, fine dining, an unusual fashion show and soulful music. As the Clubs principal fundraising event for 2017, ‘Las Vegas Night’ promises to be a night celebrating all things Vegas including a 4 course dining experience, high street fashion show with Vegas themed items thrown in, authentic casino tables, and fully trained croupiers to enhance the casino fun, finished off with live music by the undisputed king of soul Buck Taylor. The night promises to be a fantastic get together for Ballina, the GAA community as well as raising much needed funds for the continued development of the Club. Tickets for the night experience costs €25 per person and are available to purchase from Morans Shoes on Pearse St, Ballina. Supporters of the Club who cant make it on the night can still support the event by purchasing draw tickets for the monster raffle which will be held on the night, with first prize give away of a Trip to Las Vegas for two. (T&C apply) Raffle tickets can also be purchased from Morans Shoe Shop and are priced at 1 ticket for €5 or 5 for €20. Further information from Event Organiser Aidan Sweeney at 086 3507336.